This is a guest contribution from Charm Rammandala. It is often discussed that apparel industry has become very competitive due to an excessive number of manufacturers from a range of countries. Buyers have many suppliers to choose from range of countries hence suppliers really should be creative to retain the current buyers and to attract new ones. Most manufacturing countries are experiencing inflation and raw material suppliers naturally increase their prices to keep the margins. However, manufactures not seeing much price increase due to the competition hence facing a tough situation. I have noticed over the years that apparel industry in South Asia is somewhat lagging behind when it comes to embracing new innovations and technology. With exceptions of few companies, most manufactures still use the same basic industrial sewing machines with basic functions first introduced in 1980s. Let’s look at one of the recent innovation which will help to reduce the manufacturing cost and improve the efficiency. If your company is working for reputed buyers, chances are you are expected to follow the needle procedure. This is a health and safety requirement which is integrated into to buyers’ manual by most reputed buyers such as M&S, Next, GAP, George and so on. The idea is that to avoid sending garments with needle parts stuck in them. Failure to follow the procedure could result in many consequences that include, order re-check, cancellation, RTM and even huge fines. It is calculated that daily 17% of the production time is wasted due to needle procedure. Typically needle procedure means, when a needle is broken, operator have to stop the machine and find all the parts. Then take them to the designated person who’s authorized to maintain the needle breakage log and issue new needles. As you can imagine these few steps itself take few minutes. However, as we know very well, it never happens this way. Often, some pieces are hard to find. The rule is to stop the machine until you find all the pieces. This means stopping the line and getting somebody to bring a hand-held needle detector and doing a thorough search till you find it. Now imagine a situation where this happens few times in few lines…? This is an everyday occurrence in most our factories. 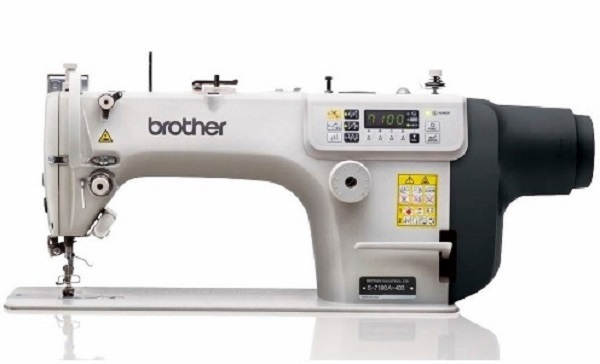 One of the clever innovations in recent years is that Brother Corporation has developed a single needle lockstitch sewing machine series with a newly added function called “Needle breakage prevention function”. Some of those models include S-7100A, S-7300A & S-7000DD. Engineers have studied and tried to understand some of the common reasons for needle breakage and come up with a solution. One common reason they identified was the poor handling of reverse stitching actuator switch. When back tacking, it is important needle to stay in the UP position. Often operators do not aware of the position of the needle which results in needle breakage. When the needle breakage prevention function is switched on needle automatically goes to the UP position and penetrate the material without vibration. This lowers the possibility of needle breakage. I have described above just a one example how new innovation and technology can help to improve the productivity and efficiency of your company. It is obvious that buyers will give preference to work with manufacturers who have this type of technology as it will reduce some of the concerns they have about the quality. Let’s look at another innovation next week. 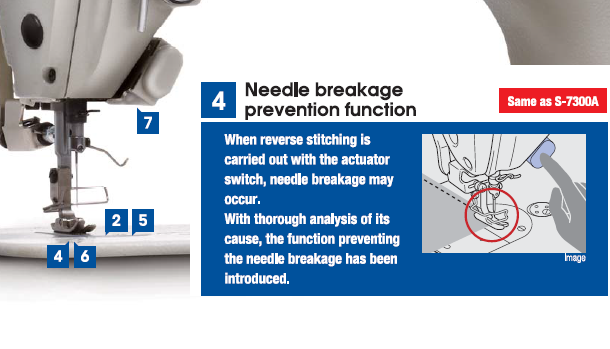 Needle breakage prevention - an example of innovations in sewing machines.